This Christmas Eve, he has only two reasons to be cheerful: Rachel's Cafe is open late, and he has a special present for Gwen Kessler. So even if he has to sit through a session of Grandpa Odd's ramblings, he knows he'll have some holiday mocha and a chance at finally telling Gwen how he feels about her. His fledgling hope is lost the moment when a new demon monster begins attacking the Star of Hope. Now, not only does Hamilton have to transform into his city superhero self to fight it, he has to deal with Starry Knight, too. Can Hamilton find a new reason for hope this holiday, or is it too much to ask for one more Christmas miracle? 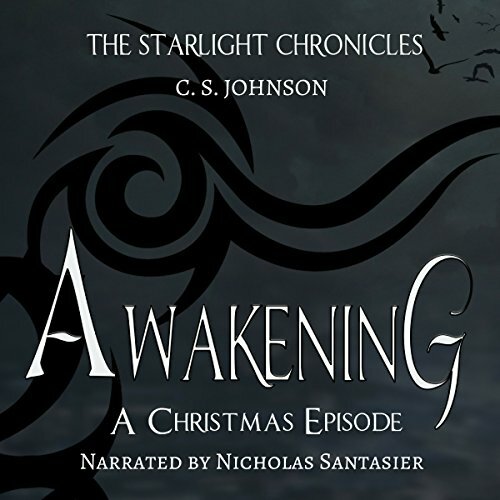 Find out in this short story set between the book one and book two of CS Johnson's Starlight Chronicles series. AWAKENING TO THE BREAK OF DAWN! AWAKENING TILL THE NIGHT HAS YAWNED. AWAKENING ALL THAT WAS BEFORE! This was my first audio book ever. At first I didn't really like it (nothing to do with the story, that is excellent ), but I think as it is a new experience it felt different as I had always read. But as I listen I enjoyed it more. Fantastic job both by the author (C.S. Johnson) and the narrator. Cynical Christmas adventures await you in this fun little short story. I love these characters, as always. It's nice to get a little snapshot of the world and it kept me entertained on my commute this morning. The only slightly annoying thing to me is the narrator's choice of voice for the grandfather. The rest is very well narrated. The grandfather's voice is just very obviously a young person trying to sound old using a really fake, quavery voice. I didn't mind the dragon's voice or the voices of the other characters. Besides that one quirk, the narrator reminded me a lot of the narrator of Eragon.